With bacterial you have a freeze-dried culture of microorganisms. 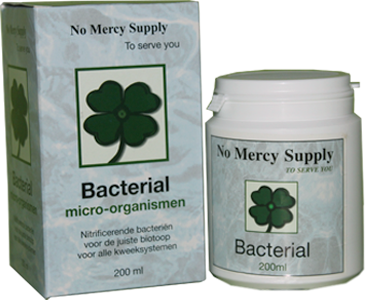 If you mix the content of Bacterial with water billions of nitrifying bacteria will grow within a period of 24 hours. Tiny as they may be there nitrifying bacteria are essential to all life on earth, including plants. Together with enzymes and moulds these bacteria transform organic waste into re-uptakeable nutrients for the plants. In order to obtain the right environment in the growth medium of your plants we developed this biological, reliable and fast working product: Bacterial. Not only does Bacterial stimulate growth, but since nitrifying bacteria are real devourers of waste you can also reduce the rising of your growth medium. Bacterial can be used in Hydro-systems and bio-systems. Bacterial needs about 24 hours to develop the maximum amount (billions) of bacteria. You can put Bacterial directly into the barrel of your hydro-system or prepare the culture separately in a bucket (10l) of water (Ph 5.8-7) at room temperature and put this water in the barrel after 24 hours. One or two teaspoons is enough tough overdosing is not troublesome. The fertilizing scheme can remain unchanged and Bacterial can beaded when considered necessary. 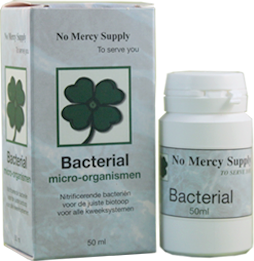 A regular, weekly application of Bacterial will give best results. Keep an eye on the barrel’s filter when adding the Bacterial mix because older watering systems risk clogging up by the remains of the medium that the bacteria originally lived in. 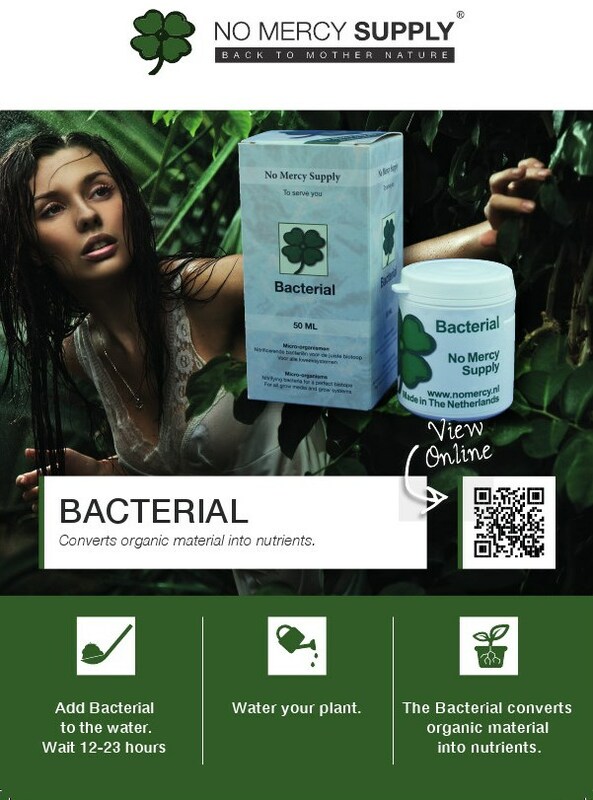 Bacterial is also ideal for rinsing your slaps, you will create a healthier environment for your plants. If you must use a fungicide, use Bacterial afterwards to restore the environment. Do not use a fungicide shortly after the application since this will probably also kill the bacteria you need so much. The usual and easiest way to add Bacterial is by mixing it with the irrigation water. Mix one or two teaspoons in a bucket of water (Ph 6.2 – 7), wait 24 hours and apply. It is also possible to mix the freeze-dried bacteria with the growth medium for your plants. A weekly application of Bacterial will give optimal results.